In recognition of the International Day for the Eradication of Poverty, October 17th, we are reflecting on what poverty means, how crop breeding helps eradicate poverty and transform lives, and how we have tried to maximise and measure those impacts. In the early days of GCP, we were largely on uncharted seas and needed to chart a course to where our efforts would have the greatest impact, a process documented in our Pathways to impact brief No 1: Where in the world do we start? Instead of using a monetary definition of poverty, since this varies so widely between places and contexts, we took a different approach. As an indicator of true poverty, we used data on the number of stunted – ie, severely malnourished – children, overlaying this on maps showing where drought was most likely to occur. Our thinking was clear and simple: poverty + drought = where GCP needed to be. 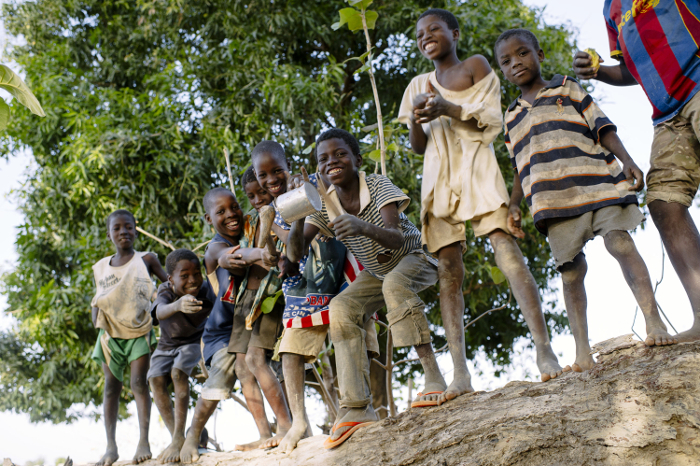 Whatever else you may think they may lack, these children in Sibi village, Burkina Faso, definitely have verve, and look full of the energy they need to play! 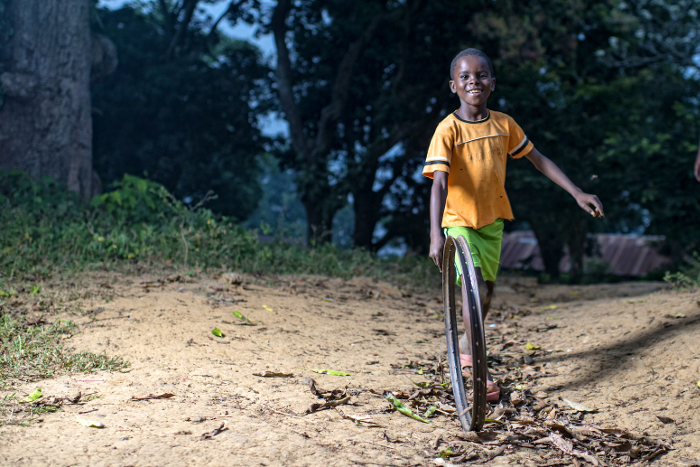 A boy plays with an improvised hoop in Lukolela, Democratic Republic of Congo. Drought routinely reduces harvests, and can be catastrophic. For example, nearly half (40 percent) of Africa’s maize-lands face occasional drought, reducing yields by between 10 and 25 percent, while a quarter suffers frequent drought, with overall losses of up to half the harvest – and total losses for some individual farmers. With climate change making droughts ever more common, drought was a natural priority for GCP from its inception. Drought-tolerant crops are therefore the most important focus for the breeders of the GCP family, though not an exclusive one. Other key traits our breeders consider include resistance to pests and diseases and nutritional fortification, depending on the crop and location – and of course all varieties should yield well in good years too. Resilient improved varieties are particularly important for the poorest farmers, as they do not usually have access to measures such as irrigation or pesticides to combat environmental menaces. Typically, the poorest farmers also live in the most drought-prone drylands. Helping poor farmers to reap consistently abundant nutritious harvests means more food for their families and often a surplus to sell –reducing child malnourishment, and poverty in general. 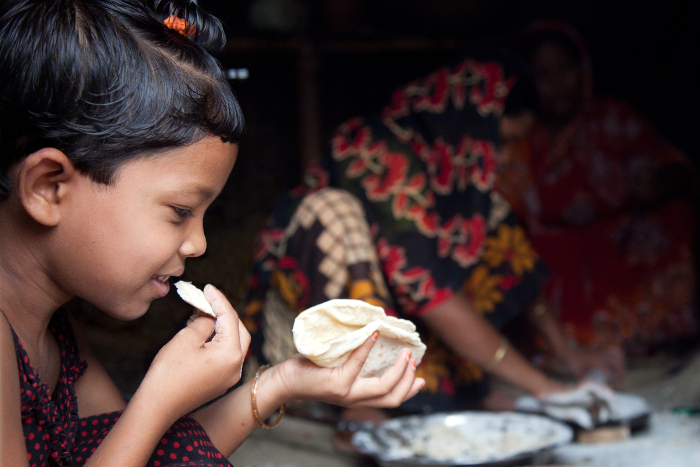 A little girl eats fresh roti at home in the district of Dinajpur, Bangladesh. A girl eats rice with her family in the Philippines. The theme of the International Day for the Eradication of Poverty 2014 is Leave no one behind: think, decide and act together against extreme poverty, and it is one that echoes beautifully with the ethos of GCP. Collaboration and partnership have always been hallmarks of our approach, particularly in terms of empowering researchers in developing countries to implement – and lead – cutting-edge science. You can find a wealth of posts on our blog about our partnerships and the ‘GCP spirit’. Collaboration is particularly important in crop breeding because one crop is often faced by all kinds of threats at once – a selection from the world’s least tasty smorgasbord of drought, heat, waterlogging pests, diseases, soil infertility, and much more. It is likely to be of no use breeding a super-crop that goes untouched by disease if it turns up its toes after a few dry days, or if no one likes the taste. That means researchers with different areas of expertise need to work together – and with farmers and extensionists too. Read the case for collective action in our Pathways to impact brief No 2: A call for collective action in agricultural research. 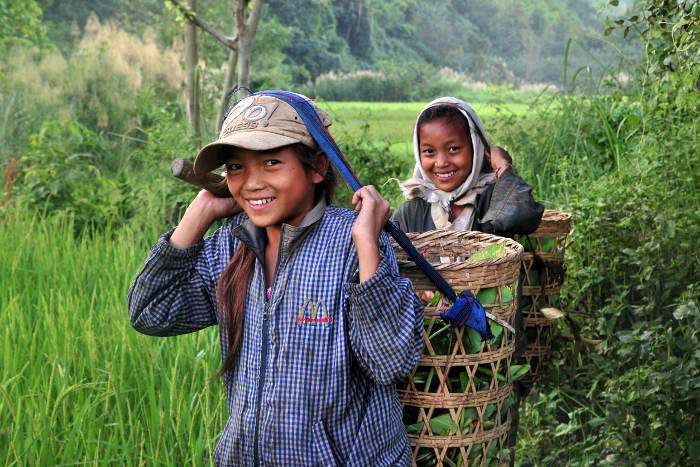 Girls help in the fields in Luang Prabang, Laos. Eyes dancing with past, present or future mischief, two cheeky young chappies from Mozambique enjoy the sweet taste of orange sweet potato enriched with pro-vitamin A.
GCP believes that using marker-assisted breeding (a range of efficient crop-breeding approaches that use genetic information to work out which plants have useful traits) to create improved varieties faster and more effectively is worth its extra cost, and has a real impact on farmers’ incomes. This cannot be taken for granted however, so get an introduction to the numerical approach in our Pathways to impact brief No 3: Molecular and conventional breeding through an economic lens. Our study found that women in Nigeria reported increased household incomes from growing improved cassava varieties, but also more time spent on cassava-related tasks – emphasising the need for researchers to be aware of the characteristics farmers – in this case predominantly women – value. 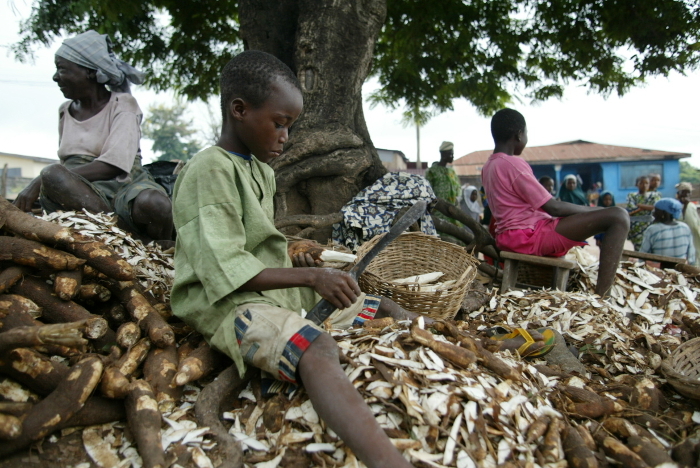 Hard at work, a boy helps to peel a mountain of cassava in Nigeria. As we mark this year’s International Day for the Eradication of Poverty, we at GCP are proud to be contributing to the eradication of poverty by creating partnerships, expertise, and ultimately crop varieties that promise abundant harvests for the world’s poorest farmers and their families – helping their children grow up big, strong and free from poverty. At play: children of the Sao Felix community in the Brazilian Amazon. Enjoy the game, but keep off the plants! 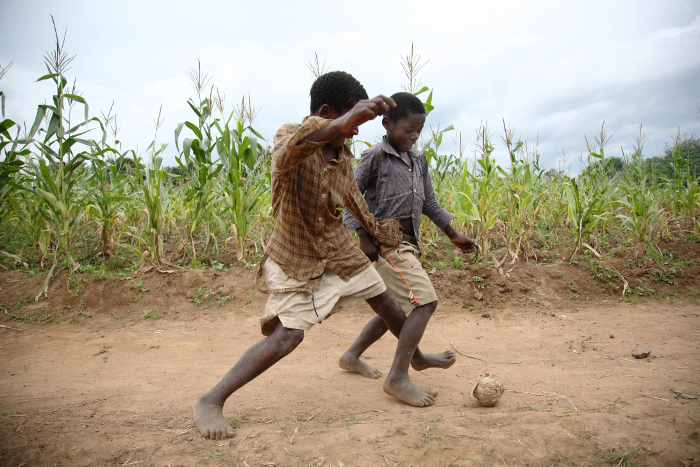 Boys play football next to maize fields in Khulungira, central Malawi.